Can Your Diving be Good for the Environment? Scuba divers truly immerse themselves in nature, but can scuba diving holidays be classified as eco-tourism? The Eco-tourism Society defines eco-tourism as "responsible travel to natural areas which conserves the environment and improves the welfare of the local people." Let's dive into this interesting debate. Discovering a whole new world of mystical creatures set against a coral background bursting with colour at 30m under the ocean tends to open the minds of divers. Suddenly the world seems much larger and more magical than the mundane existence it can become when you are working all the daylight hours a week provides. Being armed with this new found respect for the environment makes you a great advocate for protecting the ocean. However, you now find yourself faced with a catch-22 situation: you want to travel to the ends of the earth to dive the most pristine and unexplored spots you can find, but are finding it hard to justify the detrimental effects of the flight to get there. In fact, you are probably questioning whether green travel and eco-tourism are oxymorons and an impossible dream. Want the good news? With minimal planning, your scuba diving package can be good for the environment. Here are a few points to consider when planning your green diving holiday. Is Your Flight Costing the Earth? Let's face it, air travel has a larger impact on the environment than any other form of transport. But that doesn't mean you have to stay at home and miss your holiday this year. After all the plane is leaving whether you are on it or not. The most obvious way to counteract the carbon emissions of your flight is to purchase carbon credits which will fund projects that are actively working at cleaning up our Earth, investing in solar energy or planting trees to green the planet. Carbon credits to offset a flight from Los Angeles to Bali will cost just over US$ 100. If you take a dive package closer to home the flight becomes less of an issue. Residents in the USA could dive with hammerheads in the Galapagos Islands. Impossible as it may seem, but if Australians have had enough of the Great Barrier Reef, they have Fiji right on their doorstep. The treasures of the Red Sea are easily accessible to travellers from Europe. Do you regularly fly long distances? Then plan your schedule so that you are flying less often, but staying longer at your destination. You can do this by booking a combination diving package that includes a stay at a dive resort coupled with a liveaboard holiday. Or you could merge 2 business trips into 1. In this way you not only help the environment; you also save yourself time and money, thus achieving more with 1 flight than you would with 2. Many of the most unforgettable dive sites are worth protecting. By diving in these marine protected areas and national marine parks you directly contribute towards to the continued preservation of these wonders for many generations of divers to come. The entry fees you pay create employment for the local population, thus enticing them away from a livelihood based on destructive fishing practices. There is no downside to planning your holiday around diving the 'must-do' sites of the Similan Islands or Komodo National Park, especially when you are helping to fund beach cleanup programmes, the rehabilitation of mangrove plantations and coral reefs, and ensuring there are patrols to enforce 'no-take' zones. The popularity of these sites with scuba divers is helping to educate local communities about the importance of safeguarding their marine heritage. They are becoming increasingly aware of how much more valuable, for example, a whale shark is in the ocean as a drawcard for tourists, than roasting on a spit, albeit a huge one! Cruise liners may have a bad reputation as carbon slobs, but liveaboards are totally different. The whole point of liveaboards is to get closer to the marine world and therefore they are dependent on the environment for their survival. 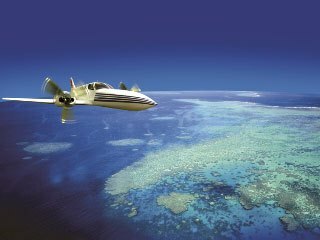 Mike Ball liveaboards 'believe that marine tourism operators can play an essential role in helping to protect the reef.' They ensure their liveaboards are regularly serviced and engineer their itineraries to increase fuel efficiency, as well as recycling and using local suppliers wherever possible. Another way to increase fuel efficiency would be to sail into Raja Ampat aboard a traditional phinisi schooner which in addition to being an adventure like no other, can take advantage of any wind to reduce fuel consumption. When large numbers of tourists flock to hotspots the result can change the state of the territory completely. That is why it is so important to choose wisely when booking dive packages. This doesn't mean you have to pitch a tent. There are a growing number of eco-friendly resorts that offer exceptional diving experiences, professional service and comfortable accommodation. Fiji's Matava Resort has won the PADI Project AWARE award for the 2nd year running. Nestled amongst the Fijian rainforest close to the Great Astrolabe Reef, they use solar power, offer homegrown organic fruit and vegetables, recycle all waste and build their Fijian bures from local wood specifically grown for this purpose. Misool Eco Resort is set in an exquisite location with memorable diving sites in Raja Ampat. They are also truly committed to making a positive impact on the environment they inhabit. In addition to instituting a 200 km² marine protected area, all structures have been built from salvaged driftwood and free-fallen timber, collected rainwater is used for showering and grey water is recycled. Visiting the ends of the earth is worth it when you wind up in an eco-friendly resort that combines diving pleasure with environmental awareness. So you're in the water at last, surrounded by the miracles of nature, this is what it's all about right? Thankfully most divers acquire a sense of reverence for the marine environment and they naturally show respect to the creatures and their homes on the reef. Yet sometimes we need to be reminded how permanent our impact can be. The mantra of many divers is "take only photographs and leave only bubbles", but capturing an award winning photograph does not justify grabbing onto live coral, or trampling a goby underfoot. Even our bubbles could suffocate the creatures that live on the ceilings of caves. Mastering your buoyancy has many advantages, including avoiding injury and being more relaxed to look at your surroundings. It also helps preserve the beauty and health of the reef for future divers. Diving holidays are an education. Without even really trying, you can find yourself learning all sorts of things about the marine environment, the protection of threatened habitats and which species are under the greatest pressure. You will often meet people involved in marine biology or environmental projects whose enthusiasm and knowledge can be infectious. This heightened awareness makes divers ambassadors of the ocean. We can then pass on our knowledge to family and friends at home who have not been lucky enough to be exposed to the wonders of the sea and the work of its greatest supporters. Each diving package you take can be a step in your education and make you more of a guardian of our marine environment. Picture this: after completing the dive to beat all dives, you are lazing on a sunbed, cooled by a gentle breeze that smells of the sea ... The one thing you are not doing is commuting to work and back, thus saving on fuel consumption and the accompanying pollution it would cause. 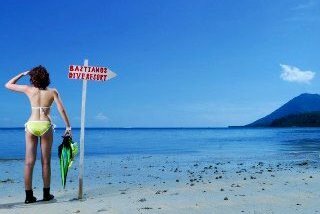 Staying at a dive resort usually means you have everything you need a short stroll away, and shared transport is used for any land excursions you may decide to take. You are also not pumping your central heating up to the max to stave off the cold and warm up your tootsies, so the individual footprint of your normal life has been diminished. Not having to prepare you own meals is another plus. Not only can you skip washing dishes afterwards, the energy cost of preparing meals for a group of resort guests is far less than the total of what each guest would expend cooking at home alone. So too do the common areas in the resort, such as the restaurant, lounge and bar, result in less shared electricity consumption. Taking all these factors into consideration, scuba diving packages often result in a nett gain for the environment. You can be an eco-tourist by travelling to the most remote destination to dive in a paradise that seems untouched by humans, while at the same time helping to preserve the planet.